Forex Trade Strategy. Intermarket Analysis and the Psychology of Trading. I told you I would be re buying gold right around the time I saw The U.S. Dollar bounce completed. Well………The U.S Dollar bounce will end tomorrow so one can’t get to picky about “the perfect entry” but…. I’m re buying NUGT here at 12.35. Right here…right now. It clearly looks like this will stretch into the new year…….before we see a major turn in both currency and equities markets. 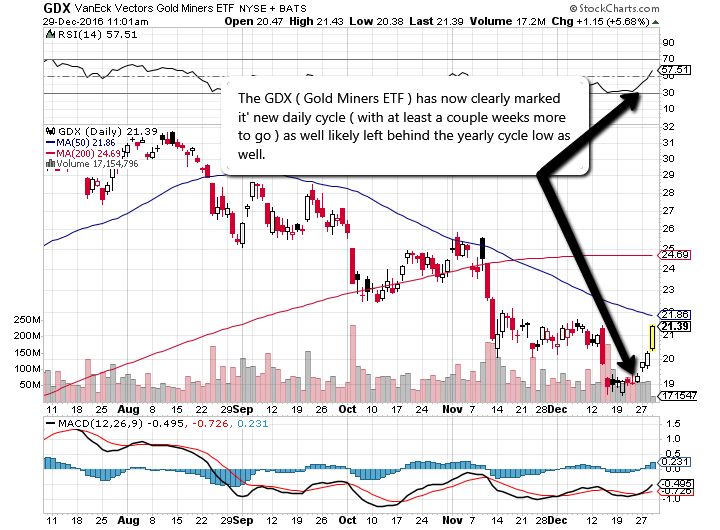 Money is pouring into silver and gold with the gold miners ( and gold complex in general ) finally showing us not only the daily cycle low….but quite possibly the “yearly” cycle low as well. This makes for some pretty solid trades as……The EUR will bottom along side gold and silver, the U.S Dollar slowly rolls over for extended losses and equities make a solid correction. Sound about right? This is EXACTLY how I am positioned with short trades in USD/JPY, long silver and gold miners ( GPL bought at 1.27 ) as well limping into further “long JPY” ideas / shorting the commods ( AUD,NZD and CAD ) with marijuana companies holding tough. End of the year selling, and who knows what other “market shenanigans” playing out these last days of 2016. I see a large-scale correction first half of January 2017. Forex Kong October 14, 2016 Got something to say? A golden opportunity? I should say so. As far as a “technical set up”goes……it really doesn’t get much better than this. Gold and the entire complex has essentially broken out of the long-term downtrend of the past “years” ( yes I said years ) then pulled back in a “huuuuuuuuge” way – now sitting at the “perfect place” to consider this as an “investment”. Don’t f^&k around here……these kinda things don’t come about every day of the week. You don’t have to rush into anything but if I was you….I’d be inching into gold and gold/silver miners here pronto ( if not already….as I have ) with consideration of a much longer term trade than I would normally consider. My goal here is simple. Take a fixed amount considered an “investment” – let’s say 25-30k and just start pounding away with small orders over the next couple of weeks. Find the trade at break even / somewhat in profit in coming weeks…..move stops to break even and don’t look at it again forever. This is “investment talk” not trade so………don’t confuse the two. Forex Kong August 24, 2016 Got something to say? I had to pull out an “oldy but a goodie”. Makes me laugh looking back…. Mining – Could it Be In Our Genes? Looking ahead……..this pullback and continued build of small gold and silver miners should prove to be very, very profitable. At this point in the game I have little concern for the price of gold as it’s trading almost exactly in tandem with the Japanese Yen ( JPY ) – both functioning as obvious “safe havens”. Appreciate that nearly everything I track is stretched to extremes right now and rightfully so as…we are so very close to one of the largest turns this market will have seen in a very long time. Why would gold be any different? A couple bucks here and a couple bucks there – not to worry. It’s always this way before a major turn in markets as the boys at your local brokerage / bank take the opportunity to push prices “as far in their favor as possible” before dumping. September has everyone back in their cubicles. 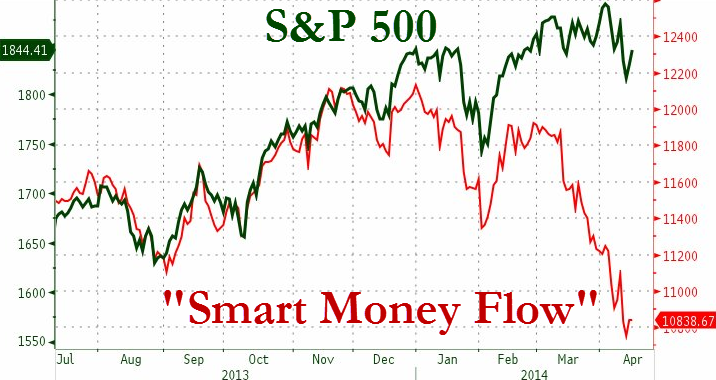 Likely back in their cubicles selling stocks and buying gold. 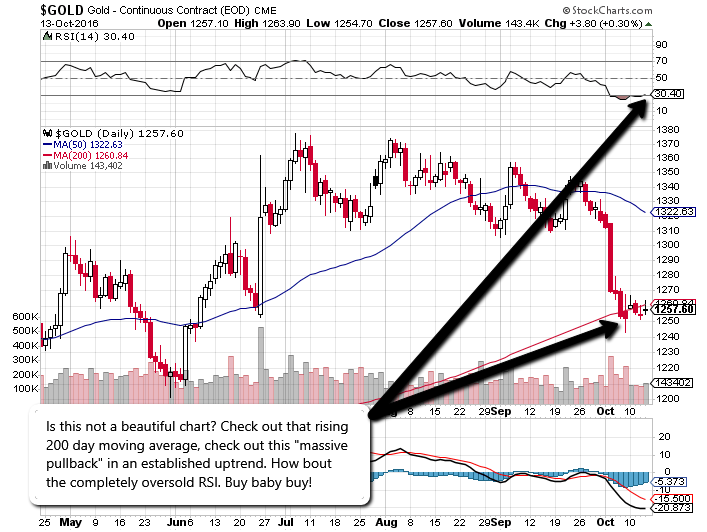 Gold is good – just not particularly “speedy” here at the moment. I know it’s hard to take investment advice from a gorilla, and if you’ve been reading / following for any length of time you’re also well aware that I am almost “always” early ( and rarely ever late ) with my market calls / trading decisions. But what about billionaire investor guru George Soros? Would you ( obviously ) look to take his word over mine? It seems legendary hedge fund billionaire George Soros might be souring in his view on the market outlook for US stocks, showing a 605% increase in his short S&P 500 position (through put options on 11.29 million shares of SPDR S&P 500 ETF) to $2.2 billion. Even though he is still net long stocks, his short position on the S&P 500 (where he owns an option which will profit from a fall in stocks prices) has now risen from 2.96% of his Soros Funds Management Portfolio to a whopping 16.65%. So now we’ve got Goldman ( looking for Japan to implode ) George ( creating a massive position short SP 500 ) and myself aligned. Another look at institutional activity ( big banks and brokerages ) over the past 6 months, while you’ve been buying and these guys have been selling to you. If you want to trade with the big boys, it might make a bit of sense to consider “what these guys are up to” no? Markets making their final bounce exactly as expected…all be it even weaker than originally suggested. Heads up people! Sept is not that far off now. Well this is it people – the countdown begins. You can count yourself as lucky – no…..”very lucky” as to have some idea where / when the merry-go-round stops spinning – this being the “final turn” before the party ends. We’re down to a matter of weeks now – if not days. I don’t generally speculate on such short-term movements, but with respect to “this one” having such significance to the longer term / larger trend – I feel it’s reasonable to put something out there. Let’s give it a full two weeks, 14 days ( give or take a day here and there ) before anyone “greedy enough” to still find themselves “hanging around” – finds themselves wishing they’d taken note. This will mark the “final surge” in global appetite for risk, and the final push towards the highs, before the historical repetition of the typical “boom and bust cycle” takes effect once again. The Fed meeting at Jackson Hole ( scheduled for Aug 21st ) will undoubtedly be the trigger, as Yellen suggests “for the very first time” that indeed it’s time for “risk takers” to exercise caution, or to be blunt – get the hell outta the way as fast as they possibly can. In a matter of weeks “nay-sayers” will be left holding the bag, giving each and every one of you ample time to act accordingly – if you do so choose. Currency markets have already made the transition ( with commodity related currencies smashed as of late ) as they will always lead, with safe havens catching the bid – suggesting the turn is already well underway. You don’t want to be the last one out the door, and their will be ample trading opportunities on the “other side of the mountain” if you can just manage to discipline yourself to “get out of this while you can” and not get caught holding. Best of luck to all of you. 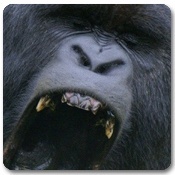 Forex Kong July 21, 2014 Got something to say? The updates trade table offers little in the way of “new trades” here as of this morning, as last Thursday’s “drop” and in turn Friday’s “pop” has left the higher time frames unchanged, and more or less “yellowed the waters” shorter term. What may be of particular interest to you this week will be USD, and “yes once again” the debate as to which way she’ll go ( with conviction and follow through ) should we see this distribution environment “flip” to something with a little more trend / conviction either way. We’ve got JPY and its related pairs under the thumb, with eyes on Nikkei if considering to “beef up / add ” to any positions under our current framework. Ideally we’ll want to see JPY “breakout” from it’s ascending triangle moving higher…as “appetite for risk” moves inversely lower. NZD in particular remains weak here this morning, but Thursday brings with it “another possible rate hike” out of New Zealand. It’s my thinking perhaps they “hold off” on an additional hike here and perhaps markets have already suspected as much but….that’s just speculation. Still no aggressive trades in EUR, GBP vs USD as I want to give it another day or so to see if USD turns lower here as I expect it to. A weak open here as Japan was weak overnight as well EU stocks so…..it remains to be seen of “the machine’s that be” will again step in at the U.S open and work their “usual magic” to keep this thing flying a little longer. Comments from both The BIS ( Bank of International Settlements) as well the IMF “AND” even The Fed suggesting that it’s getting a little out of hand here – with public perception and the underlying fundamentals now clearly out of touch with reality. Gold miners entries as of a few days ago remain strong, and the final “short SP 500” added at 1956.00 ( via Sept 191 puts ) appears to be holding its own. I’ve started a small portfolio ( actually via Kong Senior up North with his “Canadian loonies” – Hey pop!) including the following names, and harken back to a post from the “grand productive days” before all this blogging and investing got so “serious”. Could the ancient astronaut theory hold true? That thousands of years ago celestial visitors came to our planet in search of materials needed for their very survival – and in realizing the difficulties in extracting these materials from the ground, developed modern man to essentially do the hard work for them? When you really think about it…..it’s really not that far off. As a young boy I remember a hoax that played out at my elementary school. A group of the older kids had painted a bunch of small rocks with gold model paint and hid them out in the sand of the school’s playground. Once the word got out….I recall the excitement and anticipation sitting there in my tiny desk, staring at the clock, squirming in my chair, waiting for the bell to ring. “Gold! Gold! – they’ve found gold in the playground!”. We’d trip over ourselves racing out the door – eager to be the first to lay our hands on even the smallest spec of the glorious stuff. We spent hours on our hands and knees sifting, searching for our fortunes. In the end…….I never found a single piece. A silly young boy indeed – but is it really any different now as adults? Maybe mining is in our genes. We’ll see how these little nuggets pay off here in a couple of months. I TRADE FOREX LIKE A GORILLA! Find out more about "Forex Kong" and how I trade. Things Happen Fast! So Don't Miss Your Chance! Get My Trades and Analysis In Your Inbox! Trading foreign exchange on margin carries a high level of risk, and may not be suitable for all investors. The high degree of leverage can work against you as well as for you. Before deciding to invest in foreign exchange you should carefully consider your investment objectives, level of experience and risk appetite. You should be aware of all the risks associated with foreign exchange trading, and seek advice from an independent financial adviser if you have any doubts. © 2019 Forex Trading With Kong. All rights reserved.